I'm a huge fan of the Amateur Gourmet. Witty, glasses-wearing, lawyer turns cook? What's not to love? So when the Amateur Gourmet posted a contest asking readers to submit their master dish story, I was all over it like brown on rice (brown rice, that is). Up for grabs? 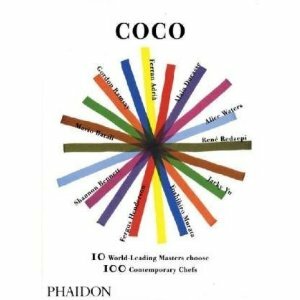 A delectably shiny copy of Coco: 10 World-Leading Masters Choose 100 Contemporary Chefs. Well, my five faithful readers, you'll be pleased to know yours truly will soon be in possession of aforementioned book. And no, it's not because I purchased one. In the interest of full disclosure, I should mention that I ran shrieking, arms waving around the office when I found out I won. Because dignified and classy is clearly how I roll. Winning post? Read on, foodie playas, read on. I have come to accept that my mother is a culinary rockstar and I will never quite measure up. Think Yoda (wearing a sari). Back in the day when immigrant mothers held steadfast to making food from their home countries, my Pakistani mother was exposing my brother and I to her own brand of multiculturalism by making everything from souffles to egg rolls to enchiladas. Although she made food from all over the world, there was no denying that my mother's specialty was down-home, Pakistani comfort food. And while living "down-home," I was certainly comforted by her food. So much so that I I never bothered to learn how to cook. Enter law school, five hundred miles away with a tiny kitchen that also served as my entryway, dining room and living room. The oven only went up to 300 degrees, the freezer was the size of a shoebox, and the hot water only worked between 10 p.m. and 12 a.m. All of that didn't matter because all I cooked were packages of Ramen and Hot Pockets. The dish I missed most while pathetically eating my ramen? My mother's chicken biryani. Biryani is the quintessential Pakistani rice dish served everywhere from weddings to quiet family dinners. The secret to a fabulous biryani rests in every family's ultra-secret spice blend and precisely-timed baking process. Needless to say, the two-inch, foil "spice" packet that came with the ramen was not going to help me. 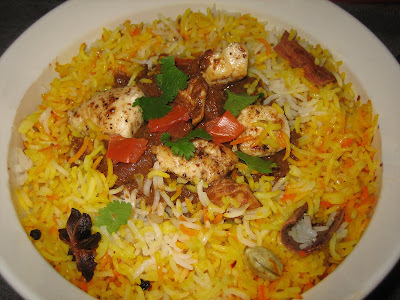 I confess, I researched biryani on the internet. I couldn't call my mom and hear her charmingly accented, "You, I told so." So, instead of turning to the expert I knew and should have trusted, I turned to the "experts" on the web. Things went horribly downhill from there. One of the first articles I read focused on some new-age concept that I had to make the dish "my own" and for some crazy reason, I took that advice to heart. Over the next few months, I made biryani ad nauseum and each time, I attempted to make it "my own." Once, I added pineapple to give it the hint of sweetness I was sure it needed. I'm certain one or two ancestors rolled over in their graves. Another time, I used Rice-A-Roni instead of basmati rice. What? i was trying to make it my own and the Rice-A-Roni came from my own pantry. After months of being unable to recreate my mother's biryani, I simply gave up. I was going to be a Superman-cape-wearing attorney who was going to save the world. There was no room in the phone booth to make biryani. Fast forward to 2010. I'm married to an awesome, bass-playing, uber-intelligent Pakistani man... who loves Pakistani food. Time to sink or swim. Pineapples and Rice-A-Roni be damned, I called my mother for guidance. And I continued calling her at five-minute intervals while boiling the rice, making the spice blend, cooking the chicken, layering the rice and chicken mixture and baking the entire concoction. When I pulled the dish out of the oven, both I and my phone bill breathed a sigh of relief. Things looked and smelled almost as great as they did 20-some odd years ago in my mother's yellow-checkered, 1970's kitchen. Is the chicken biryani a dish worthy of a master chef? I don't know but it's certainly worthy of my mom, the only master chef in my world! 1) Use quality basmati rice. Not jasmine rice, not sushi rice and certainly not Rice-A-Roni. 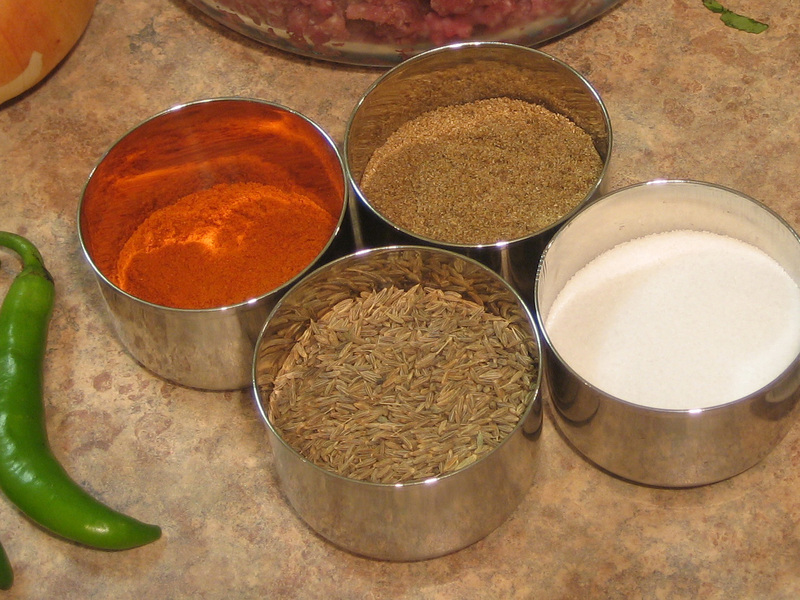 2) Toast your whole spices and grind them in a spice grinder to make your spice blend. Take two deep breaths and accept that you will not be able to use the grinder to grind whole coffee beans ever again. 3) If you want to make the dish "your own," substitute the chicken with beef, lamb or even vegetables. Don't use pineapples. They are not your friend. 4) Find quality saffron, soak it in a tablespoon or so of water and pour it on the layered-concoction before baking. That awesome smell wafting from your oven is the reason why saffron is more expensive than gold. 5) Call your mom. I bet she'd be glad to hear from you. That is a very entertaining article! It made me laugh and miss my mom's cooking. I haven't tried making biryani yet only because my husband doesn't like it but I love it, so I think one of these days I'll treat my self to some biryani, I just need to figure out how to make it in smaller quantity. Great article...reminds me how some things are best left alone. You have inspired me to make Biryani. Can I call your mother? I love your ability to open up and share yourself with your readers. Reinforces the fact that being in the kitchen is like an experiment...sometimes you need the constants for it to work. Nutritionist- He doesn't like biryani?!? I'll try not to hold that against him :) You should make a giant batch, have a dinner party and spread the biryani love! Hi! Nice to "meet" you! Just saw your blog and anyone who is a Mark Bittman fan is good in my book! I particularly liked this post because it's the same thing with authentic Chinese recipes in English. If it weren't for mom (and now Google's translation service), I think I'd be stuck with bastardized recipes. Yay for moms!!! This is a great story and congrats on winning! To be absolutely honest, I am embarrassed and disappointed to say I think I have never eaten biryani. :( Obviously I have been missing out! I will have to give it a try soon! I'd like your mother's recipe, pleaase!